The Teaching English as a Second Language (TESL) minor with the undergraduate secondary education sequence leads to a K-12 ESL Licensure in Minnesota. You'll be encouraged to choose Education Abroad programs to give you a global perspective on language and culture. Campus and community organizations and volunteer opportunities will give you a chance to practice what you learn in classes and internships. Cross-disciplinary work encouraged through second majors or minor degrees. 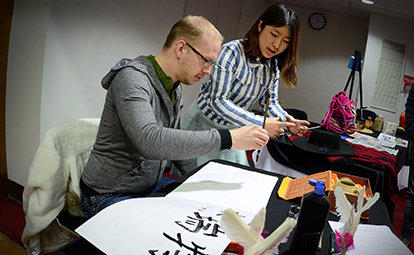 Campus organizations and classwork encourage development of multicultural and international perspective. Summer camp for English language learners provides opportunities for practical experience in teaching and leadership. Use of skills learned in English coursework is encouraged in internships and volunteer opportunities. TESL and Linguistics programs highly rated in external reviews and accrediting agencies. Accredited by the National Council for Accreditation of Teacher Education (NCATE)/Council for the Accreditation of Education Preparation (CAEP). The Write Place provides individualized help in writing while respecting a writer's authority and ownership of their work. Notable alumna: Valeria Silva '90 is superintendent of the 39,000-student St. Paul Schools district. Much of Silva's earlier work was done in immersion schools and English language learning programs.